Frederick Hollyer took this photograph in the garden of the Grange, the Burne-Jones's house in Fulham, a suburb of London. 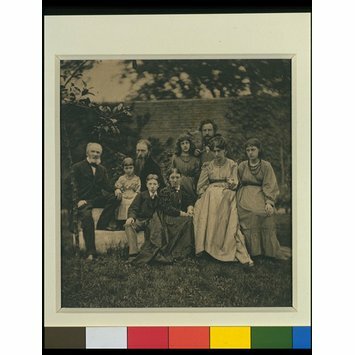 It is one of a set of photographs that he took of the families of William Morris and his friend Sir Edward Coley Burne-Jones. 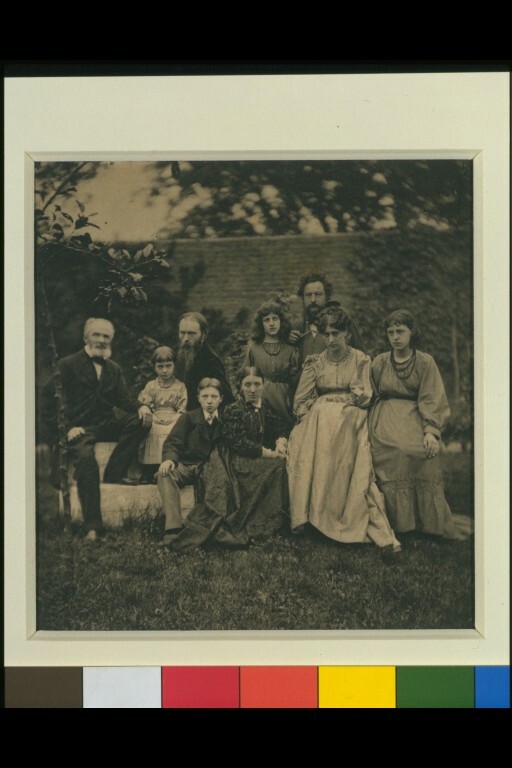 From left to right the figures are: Burne-Jones's father, Edward Jones, who was on a visit from Birmingham, then Margaret, Edward, Philip and Georgiana Burne-Jones. Standing are May and William Morris. Jane (Morris's wife) and their second daughter, Jenny, are seated in front. Hollyer took up photography about 1860. He became popular as a professional photographer in fashionable artistic and literary circles. From the mid 1870s he collaborated with Burne-Jones on a series of commercial reproductions of the painter's work. His studio may also have provided photographic services for Morris & Co.
Taken in the garden of The Grange, the Burne-Jones's house on the North End Road in Fulham. 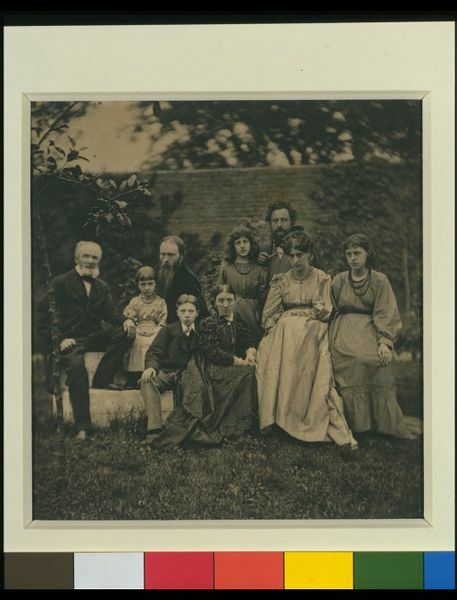 Photograph of the Morris and Burne-Jones families taken by Frederick Hollyer in Fulham, 1874. Christofer Conrad and Hatje Cantz, Edward Burne-Jones. Das Irdische Paradies Stuttgart: Staatsgalerie Stuttgart, 2009. ISBN: 978-3-7757-2516-3 (Deutsch), 978-3-7757-2517-0 (English).